For many a pet, Halloween can mean a night spent home alone. For Duke here, there's little to do but scarf down Greenies and wait for the kids to come home. Thursday, October 30, 8:15am, Princeton Public Library, a breakfast and presentations/discussions on making streets safe for bicycles. Realized the other day that, unlike some, I have long associated bikes with safety. I grew up near an observatory, and because of the restrictions on light pollution, the neighborhood could be very dark at night. For a kid with a fertile imagination, not so much for ghosts and goblins but for some menacing figure that for all I knew could be hiding behind the nearest tree, the speed of a bike at least gave me a better chance of escaping unscathed. The new Neuroscience building may have played a small role in an evening of exciting soccer at Princeton University this past Saturday. As the sun angled low, the white facade presented a bright white background to the Princeton women's goalie as a free kick by Harvard's Bethany Kanten came rocketing from the far side over her head and into the goal. Because of all the machinery, lighting, and people in large buildings, they tend to generate an excess of heat from within, which may explain why the designers of the Neuroscience Institute wanted to reflect off as much of the afternoon's sunlight as possible. While I was researching the impact of a brightly shining building on the game, Princeton's bright sophomore star Tyler Lussi was scoring the tying goal at the other end of the field. She and senior Lauren Lazo are particularly fleet of foot. Incredibly, Lussi's four goals were not enough to win, with Harvard star Margaret Purce getting the go-ahead score late in the game. Halfway through the men's game later on, I went foraging for ripe persimmons just below the pedestrian bridge on the other side of the Neuroscience building. Not your typical halftime activity. The men's game was marred somewhat by poor officiating, but it too demonstrated the importance of having an exceptional player or two in a sport where goals can be so hard to come by. The Harvard men fielded a strong team, but without a real standout who could make the difference. Unfazed by losing a man early on to a red card, Princeton promptly scored two more goals to take a 3-0 lead, then held on to win, nearly erasing the sour taste in my mouth left by the persimmons. While walking the dog around the block around 9:30pm, I looked up at the usually not very interesting New Jersey night sky and saw two short, narrow, parallel, contrail-like slashes in an otherwise cloudless sky. By the time I got home and got a camera, they had drifted southeast towards the horizon. Throwing a cluster of words similar to the title of this post into the googlesphere yielded first this post, and then this one, on a site called contrailscience, which gives a logical explanation: jets descending through a relatively thin layer of moisture. The lines are oriented towards Newark/New York, and an additional possibility is that the jets entered the layer of moisture, then turned off their engines as they began coasting in to the airport from about fifty miles out. We hear this frequently over Princeton--what sounds like downshifting as a jet flies over. When last we saw our writer he was walking his dog through a dystopic residential landscape of yardwaste-littered streets and trees fallen prey to volcanic eruptions of mulch. The rising tide of misplaced organic matter seemed beyond his powers to counter. 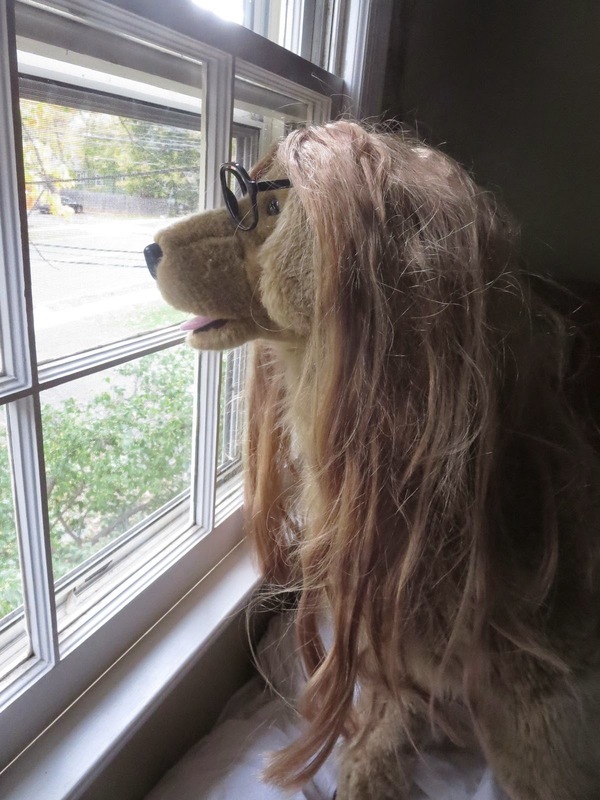 All he had was the power of his pen (in the form of a blog), his trusty dog Leo, and, adding to the sense of dysfunction, a bike made nearly unusable by deferred maintenance, in the form of wobbly wheels and a stretched chain. Two blog posts later, the tide has turned, particularly for the Norway Spruce, rescued from a siege of volcanic mulch by the tenant, who, we choose to assume, was inspired by the blog post to seize the moment and take organic matters into his own hands. And the bike has made considerable progress towards recovery since visiting the student Cyclab, in the basement of Rockefeller College just down University Place from Nassau Street. Knowing next to nothing about bike repair, I stopped by and got assistance truing the wheels, adjusting the brakes and replacing the chain. All assistance and parts were free, thanks to financing by the college. It's open to students and town residents alike, and I have to say that town residents can present the students with new and exciting challenges. Until a town resident like me showed up, the student who helped me would have had no opportunity to encounter a bike chain so woefully and for so long neglected. He didn't believe me when I passed along a local bike shop's warning, that a chain stretched by ten years of use and altogether too sporadic oilings will have worn down the gears so much that a new chain will not work. We put a new chain on and, sure enough, the chain was incompatible with the worn down gears, and kept slipping. On the next visit, I'm hoping they'll help me put on a new derailleur to better match the new chain. They'll have learned a real world lesson about bike chains a lot earlier than I did, and This Old Bike will be ready to take on another winter of salty streets. After a Monday evening spent at a town council meeting earlier this week, I was struck by how I feel pleasure when others feel fear. Take as a for instance my bike ride over to town hall. There was the mild exhilaration of exercise, the comfortable temperature, deep breaths of evening air, and a mist that felt refreshing on the face. I later told someone at the meeting about the pleasure of mist, and she said she'd worry that the bicycle tires might slip on the pavement. Well, bicycle safety is important, but in an instant, pleasure was turned into fear. At the meeting, a Princeton Environmental Commission member presented a resolution on leaf collection. There has long been a tradition of dumping any and all yardwaste, leaves and brush out on the street, helter skelter, with the expectation that big machines will come to carry it away. The commission's resolution calls this practice wasteful, dangerous and largely unnecessary, given that nature long ago perfected the art of breaking down leaves, etc. into valuable fertilizer for the next year's growth. But Princeton, somewhat like sending kids to private schools, has traditionally also sent its leaves to a finishing school outside of town, where the passage from raw bits to finished compost is surely more reliable than homeschooling leaves in a back corner of the yard. In New Jersey, it could be called "pay to decay". With leaves, as with a bicycle, I register pleasure where others experience fear. I have vivid memories as a child of the whole family raking the yard. The brightly colored leaves would dance before us as we raked them onto a tarp and hauled them down to the woods. I'd take a running jump into the high, loose pile of dry leaves, be surrounded by their crispness and color, then crawl out, fluff up the pile and take another running leap. Years later, wanting to grow some tomatoes in our soil of dense clay, I knew to go to where observatory's grounds crew had been dumping leaves in the woods year after year, in a pile so large and broad that it had overwhelmed the capacity of the trees to consume all the nutrients. I dug down to get the richest compost anyone could desire. But at the town council meeting, this pleasure too was injected with fear. One council member asserted that leaf piles in the woods could kill trees, the logic being that if leaves are piled too high, they could cut off water and oxygen to roots. What I have observed is quite the opposite, that tree roots, like kids, go running towards any pile of leaves just as fast as their apical meristems can carry them. Gardeners hoping to get compost from a normal-sized leaf pile in the backyard will likely find that the tree roots have beaten them to the goodies. The biggest fear for council members, though, was aroused by the commission's suggestion that leaf/yardwaste collection be phased out in coming years. There was a promise made during consolidation that there would be no cut in services, particularly to borough homeowners with small lots. The urge to dump leaves on the street, which in turn sets in perpetual motion the scramble of town employees to deal with the mess, seems now as deeply embedded in the populace as the migratory instinct in wildlife. Though we are one of the most adaptable species on the planet, anyone wishing to change that entrenched horticultural habit will have to slog through a blizzard of rationalizations for why policy, and people, couldn't possible change. Council members may well have concluded that hell hath no fury like a leaf spurner spurned. For someone like me, who has long seen leaves as a gift to be valued, this mass banishment of leaves to distant locales is hard to fathom. So much depends on whether one perceives nature to be ally or enemy. A volcano has erupted on Linden Lane. You know, the much maligned piling of mulch against a tree trunk that could prove deleterious for the tree. I'm not passionate as some about this, but thought I'd knock on the door in a friendly neighborly sort of way. Nothing to it, really. Empowered by newly gained knowledge, the resident would pull the mulch away from the tree and the problem solved. Five minutes, tops. The guy who answered the door is a renter. Nice conversation as his pre-toddler looked up at me with bright curiosity. But it's the owner who hires the landscape crew. The renter would need to contact the owner, who would need to contact the landscaper, who would need to alert his crew, which has probably always done things this way and would need persistent reminding to change. In other words, a five minute task to benefit the tree has just become impossible. Another example: An old window-mounted air conditioner runs all day in an office overlooking Nassau Street, barely cooling the small room. It needs to be replaced. Seems simple enough. But the building owner requires a new one be 110 rather 220volt. The building is so wired that all 110 appliances are automatically shut off at 8pm, as an energy saving policy. But the office is sometimes used until 9pm, and on hot summer evenings that last hour could be uncomfortable for clients. So the old AC rattles on. Another example: A homeowner's landscaper dumps leaves on a street frequented by kids on the way to school. The leaves narrow the street, pushing bicyclists out into car traffic, and the leaf dumping ignores the town leaf pickup schedule. The homeowner has a huge lawn and could easily pile leaves in a back corner. Friendly conversations ensue with the owners and with the landscaper, who drives to Princeton from south Jersey every couple weeks, but no change. Funny. We're a highly adaptable species, and yet the resistance to change, both personal and institutional, so often wins out. Who knew? 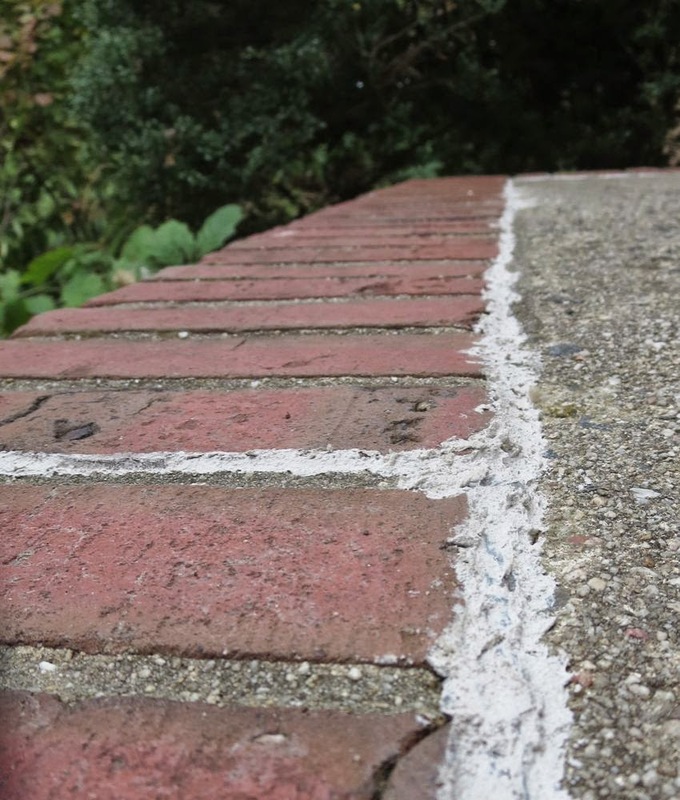 All these years, walking on the back patio, or stepping up to the front door, and never noticing that someone had previously gone to the trouble to caulk the cracks that develop between the bricks and the concrete. Why would they have done that? The question would not have occurred to whomever I was in the past. But in recent months, the presence of those cracks has been seeping into my thoughts, until finally a few days ago I found the tranquility within to stop, and to ponder said cracks with a sense of foreboding. I began to worry about the rain, and how it might seep into those cracks, and freeze in the winter, expanding the cracks and loosening the bricks. How did I make it through ten years without worrying that the front steps might be corrupted beyond repair by these silent forces of entropy? Thank you, imagination, for your intimations of impending infrastructural decay, for I rode their power directly to the neighborhood hardware store, there to buy caulk to load into my caulk gun and apply with much haste and some precision, in the fading light, with rain and winter fast approaching. And how could I have lived so many years, in a lifelong pursuit of knowledge, and yet remained unaware that a bicycle chain stretches over time, thereby wearing down the derailer, which is really spelled derailleur, which is all the gears in back, that then need to be replaced along with the chain at considerable expense, all because I had no idea there were consequences for not replacing a bike chain periodically? This, actually, can be explained: Because I never before lived in a town where all that I needed was within biking distance, and so hadn't before had occasion to wear out a bike chain. Speaking of caulkguns, a proposed slogan, to update "from swords to ploughshares": "From guns to caulkguns". And begin by melting down those army surplus armored vehicles from Iraq, rather than giving them to police departments. "From guns to caulkguns, the better to mend the deepening cracks in the world." And He shall judge among the nations, and shall rebuke many people: and they shall beat their guns into caulkguns, and their assault rifles into loppers: nation shall not lift up sword against nation, neither shall they learn war any more.—Isaiah 2:3–4 (the retrofitted version). If you weren't able to make it to the Climate March, or only got to see the portion of it you were a part of, here's a showing and telling of the whole progression, all four hours worth, as it passed down 42nd Street. Included are its many themes, a compilation of the most memorable slogans and chants, and serendipitous visual interactions between the march banners and the commercial billboard mega-images that served as a visual frame for the marchers. Having long ago realized that human-caused destabilization of the planet was the overarching issue of our times, I was deeply moved by its spirit, its sounds, diversity, and sheer scale. "You watched? ", they ask, disappointed. "Why weren't you in it?" Well, I was, or at least I felt like I was a part of it. Standing next to the stream of humanity passing by, I could look into people's faces, read the banners, hear the chants, feel the exhilarating rhythm of the occasional band, absorb a full sense of the march's size and variety. Early on, some people in the march were calling urgently to us on the sidelines to join in. "Don't watch. Join! ", a banner read. Here I've been writing about climate change for years, squeezing carbon energy out of our lives, and at the biggest climate rally ever, they thought I was one of those standing "on the sidelines." But others in the march were happy to have someone standing there to connect with. What, after all, were all the banners for if there were no one to read them? Who would have witnessed the infinite variety of expression, from the joy of unified purpose to the bedrock seriousness of the cause? The march did not lack for participants. The turnout was so massive that when time ran out they still had many blocks worth of people waiting at the beginning of the route. And to be walking in the march would have, in some ways, been more like being in the stands at a football game, looking at the backs of everyone's heads. There was, though, one magnificent moment that our late arrival caused us to miss. Earlier, as we had stood beside the still empty street midway in the route, waiting for the marchers to arrive, the march had seemed stuck in the distance. I later heard that the marchers, before they reached us, had stopped at 12:58 for two minutes of silence, hands linked above their heads in tribute to those already victimized by the transformations wrought by climate change. After the silence, a great roar rose from the streets, beginning at the front of the march and traveling back up 6th Avenue and across on 59th, like a wave, a warning sounded, a primal scream for the world we take for granted, the magnificent spaceship we call home. By my wife's telling, that moment was like no other she had ever experienced. When the march again began moving forward, it came by us led by one of those big, black SUVs with tinted windows. But from there on, it was all walking humanity, stripped of the star-crossed machines that serve our present needs while invisibly altering the planet upon which life ultimately depends. By chance, we were situated on a block of 42nd Street lined with immense images advertising everything from beauty products to McDonald's hamburgers. Serving as backdrop for our photos, relevantly enough, was an advertisement for Destiny, a sci-fi computer game set 700 years into the future, in a shattered world "littered with the remains of humanity's golden age." That's one of the greatest challenges of conveying the urgency of climate destabilization. Rather than making a mature acknowledgement that we are all part of the problem and all need to be part of the solution, rather than using today's magnificent animation capabilities to help people see where we're headed and motivate us to change our ways, American movie and video culture is instead churning out epic battles between good and evil, reveling in the drama of future ruin. Thirty years into the climate crisis, we still haven't gone much beyond black balloons to aid visualization of CO2. "Keep it in the ground", her sign says. It's okay, as far as it goes, but why, in this image-bathed culture, are the Masters of Imagery not doing more to help this woman help us visualize the invisible? Sometimes, as the evening news programs lead with whatever bleeds, or the BBC News sounds like an endless re-answering of the question "What did people do with guns today? ", I wonder if sustainability, if it were attained, would deprive the news media of the dramatic storylines it needs to attract an audience. Sustainability would be highly satisfying in terms of happiness and well-being, but for a consumerist culture hooked on a diet of death and destruction, any step towards solving problems and living in peace actually poses a threat. Health and happiness make a lousy script, devoid of the sort of dramatic tension and violence needed to catch people's attention and compete in the news media marketplace. At least for four hours on a Sunday afternoon, food justice eclipsed the dominance of DESTINY. Next to the "Destiny" billboard was an even larger and equally relevant sign boldly stating "The curve changes everything." Though I'm sure Samsung's curved thin screen TV is exciting, the curve that changes everything is the curve on this blackboard, where atmospheric CO2 levels took a radical turn upwards as the industrial revolution took hold, there, above the head of the woman with the blue shirt. As the marchers passed by (this banner and sunflowers marked the leading edge of the march), we started to make a collection of the more memorable slogan and chants. Some of the banners were huge. This one stretched a whole city block. I have no idea what it said, but it was really impressive. Other signs were small. Do you see it, the little blue one the girl with the red ribbon is holding, quoting Bob Dylon? "How many times can a man turn his head, pretending he just doesn't see?" That's really the central question, isn't it? How, in the information age, can people remain so stubbornly uninformed? I also see someone I know poking her head out in the upper right corner. Hi, Liz! What are the chances of unknowingly photographing a familiar face among tens of thousands of marchers? One sign, contrasting the Frontlines of Crisis with the Forefront of Change, depicted a Diego Rivera-like struggle against rising seas, while the real men holding the center pole struggled to keep the sign aloft. Here, for me, is what makes climate the central issue of our times. "There's no planet B", said one placard. "Earth's first. There is no second. ", said another. We mess this one up, we're looking at a very harsh universe out there. One sign, captured the urgency in one word: "CO2NSEQUENCE". The vaunted founders of our nation were thinking longterm, as far beyond their lifetimes as they could imagine. Why aren't we? A lot of slogans centered around the failure to act. "Oh shoot, we left the oven on." "If you're not part of the solution, you're part of the pollution." "Care now, you might be coming back." Or, stated simply, stripped of rhyme and wit: "It's time to cut carbon"
My favorite chant, heard several times during the march, was "HEY! oBAma! WE DON'T WANT no CLImate DRAma!" Why aren't we acting? For some, the answer is clear. The blame should firmly be put on those among the economically powerful who have been funding doubt. Others pointed to a massive failure of the market, which doesn't seem free to place a price on the future cost of using carbon-based fuels. This guy had one of the more creative signs, linking the way we view our inner nature to the way we treat outer nature. There was a small kid carrying a big sign, calling for unified action. There were kids "marching for Mom's Clean Air Force". A young woman held a sign saying, "Climate--I was just getting to know it". On the other end of life's story, there was a gang of "Elders off their rockers." Along with that intergenerational unity, this sign, "100% for the 100%", spoke to the potential unifying effect of all people realizing that climate change is a common enemy that we all can contribute to fighting. Even the alleged conflict between economy and environment is questioned. "The economy can't swim. ""Save the earth, and capitalism". And here: "Preservation is not liberal or conservative; it is common sense." and "No economy on a dead planet." These speak to all the climatological and ecological services that form the foundation for a healthy economy. "Live on nature's income, not its capital. ", was getting at something similar. "Green capitalism can't save us. ", said one placard. More emphatic was the chant: "The PROBlem is the PROFit, and WE are GOING to STOP it!" Fracking was not winning any popularity contest. There were endless plays on the word "frack". There was some rudimentary mathematics (Fracking = Death) and some playing on words ("Buck fig oil"). "Climate change leads to war, war leads to climate change." The march grew denser as the hours passed by. Marchers spilled into the sidewalk. If I hadn't exactly joined the march, the march had joined me. Even the marquee across the street was impressed. Here's an angle I honestly hadn't considered. I had always thought that our alien overlords, who had already destroyed their own planet, were taking sadistic pleasure in watching our self-destructive behavior, and had actually manipulated our political and mental processes so they could sit back and watch us blow it bigtime on this little piece of paradise. This was a rare shift into the doomier and gloomier. Made more believable by the surging numbers of marchers, some placards spoke to the unstoppable power of a social movement. The chants often emphasized this ascribed power: "The PEOple...uNITed...will NEVer BE deFEATed!" Or, "We're going to BEAT...BACK...CLImate CHANGE, we're going to BEAT BEAT BACK BACK CLImate CHANGE!" Or "What do we want? CLIMATE JUSTICE. When do we want it? NOW!" College students linked the social movement to collective economic influence, through divestment in carbon-based energy companies. This was about as straightforwards as you could get. Or alliteration. Which slogan is going to spur the most rapid divestment, the ones with rhyme or the one powered by alliteration? Those Duke students look pretty confident. This man offered a pillow talk version of the Divest theme. By the way, there's a letter to the editor that makes a post-Climate March call to look at our portfolios with divestment in mind. It links to sustainableinvesting4all.com, which looks promising. Throughout the march, peeking through the crowd from across the street, a model for Sephora offered her own quiet suggestion. It's time for a makeover. Some signs spoke specifically to the predicament of NY City. There was considerable dismay directed at Fresh Direct, whose delivery trucks have been fouling the air in some neighborhoods. FRESH DirECT has GOT to GO, hey HO. And something more general: "Rising tides, rising rents, rising people." I'm thinking these must be folks from low-lying areas of the city. An acrobatic bicyclist carried an I Love NY sign showing water flooding the letters "NY". His bike looks well adapted for pedaling in flooded streets. and graceful elevated birds, their flight symbolically dependent on their human stewards below. Native Americans had a presence. Indigenous people's rights were placed in opposition to incursions into their lands by oil companies. Yasuni National Park in Equador is threatened by oil exploration and extraction. An internet search suggests that REDD+ stands for Reducing Emission from Deforestation and Degradation. There were calls to respect the four elements. I'm thinking this is Mother Earth, who showed up in various forms and languages. In this chance photo, a nurturing embrace of earth and its fertility, suggesting love, devotion, and gratitude, competes bravely with the looming Destiny of rapacious humanity standing bold and proud upon the barren ruins. Think Wall*E.
In another chance photo, a kid's placard commented on the climate implications of all those McDonalds hamburgers. I was glad to see some emphasis on the important role in climate maintenance that fossil fuels play when they are left in the ground. Energy companies see underground reserves as trillions of dollars of potential profits. But leaving them underground would likely mean trillions of dollars in reduced damage from destabilized seas, climate and economies. "Coal, gas, and oil. Leave it in the soil." managed to turn this into a rhyme. Some signs were elaborate and thoughtful, but a challenge to read. During one lull in the march, early on, an attractive woman, playing the cheerleader, held a sign high while she jumped up and down, looking expectantly at all of us lining the street. She wanted us to cheer, but her sign was very complex and impossible to read with all the bouncing. We were ready to cheer, but didn't know quite for what. I asked this man to pose to allow a proper reading. This woman sought a new definition of masculinity, in which a smaller carbon footprint is sexier than that oversized pickup truck. Another woman held a banner saying, "I'm hot, but the planet shouldn't be." And then there were "Mermaids against offshore drilling." Mixed in was a lot of can-do about alternative energy. The question "Why? ", placed over a coal plant's smokestacks, had its complement in "Why not?" combined with an image of a solar panel. "Turn up the hope, not the heat." and the endearing "It's not too oily to go solar." "Cook organic, not the planet." and the simple assertion: "Lawns are dumb." When I saw "Support hemp for a clean planet. ", I called out HEMP!, with raised fist. The signholder returned the cheer in kind. You'd cheer for industrial hemp, too, if you'd seen the documentary "Bringing It Home." Just to spread the love, I also shouted out "PUPPIES!" when a woman walked by with an "I'm marching for puppies" sign. Later in the march, a science theme came through, stating emphatically that the debate is over. By then, the march was one solid mass of humanity filling the urban canyon wall to wall. Then, at 5pm, exactly four hours after the march had started at our spot along the route, the march ended. I tried to make some calculations, roughly having counted 300 people passing by per minute. Times 240 minutes, that doesn't exactly equal the 310,000 figure being used, but with the roughness of my count, all of those who didn't make it to 42nd Street, all those told to disperse when time ran out, and all those on the sidewalks, it could add up. The BusForProgress came by, then four policeman on motorcycles. Then it was over, and the streets were reclaimed by cars that our alien overlords make us drive to satisfy their jones for dystopia. Can't they just get a Netflix account and leave us alone? 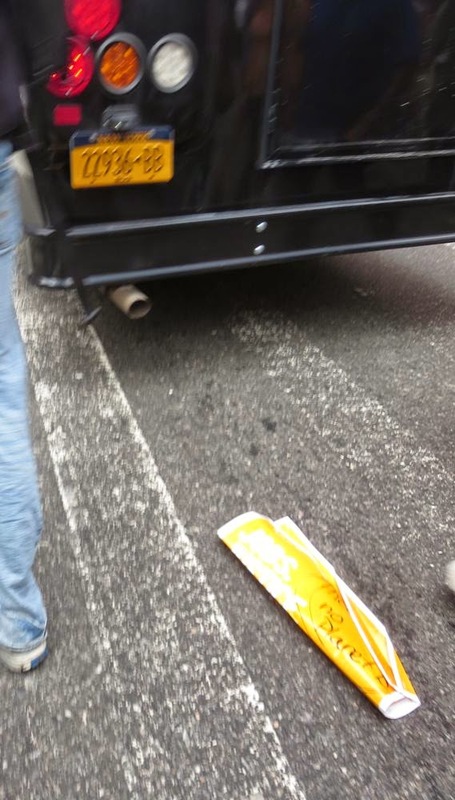 I've heard there were some complaints about the mess marchers left behind, but where I was there was almost no trash, except for this abandoned sign run over by a delivery truck.